8/10/12 I need to jot down what happened at my last Dr’s appt, but I’m not going to. I’m venting. I’m tired. Physically and emotionally. My house has dust bunny’s and needs a good dusting/vacuuming, and I leave a trail of half empty water glasses and food where ever I go. I have been puking 2-5 times a day and my stomach has been in constant pain since last night. I had difficulty sleeping from it. It feels like rocks are trying to move through my belly. All I can do is lie in bed and barely feed myself. I hate this. At the appt I got to see Dr. H which was nice because I hadn’t seen him since week 5! We spent a few minutes in his office catching up on everything that had happened since week 5 and then went in for the ultrasound. At the time it had only been a few days since my last bleed, so of course the first thing we saw was the hematoma. It was pooled above my cervix and under the baby, then all the way up the side of the baby and a little over the top. I don’t think he could have measured the length, it was long and the hematoma was almost the size of the whole gestational sac. At it’s widest it measure 1.3X1.8 cm. But the size isn’t supposed to matter, it’s supposed to be the location. So naturally I asked if it was behind the placenta (the worst case scenario because it can, can (not will), lead to loss of the baby from lack of blood supply or the placenta being torn away from the uterus). Dr. H said yes it was behind the placenta, but when I looked at the sonogram it seems like the placenta is in the upper right and the hematoma in the upper left. But I’m not a sonographer and I know it can be very hard to distinguish at this early stage where it is located without using the blood flow thingy, which he didn’t use. The baby measured perfect almost to the day and as I mentioned before. It moved it’s over proportioned head and it’s little arm. The heartbeat was 155 bpm. Dr. H decided to decrease my progesterone to just at night because it was making me very loopy and dizzy during the day. I had also lost more weight. Initially they had talked about seeing me every week, but since my bleeding episodes only seemed to last a few hours the last 2 times he decided to just see me in 2 weeks like he normally would at 10 weeks. In the days that followed the appt I was absolutely miserable. All I could manage to do was lie in bed all day, puking 2-3 times a day, barely eating, nauseous all day, stomach pains all day. And then I got constipated for 6 days. Finally I couldn’t take anymore and broke down and went to the clinic onbase. I really didn’t know if I needed to go there or to Dr. H’s, but I figured I would have more luck getting the Zofran onbase. They gave me a prescription and recommended milk of magnesia to help unclog things. I ended up giving myself diarrhea and puking with the milk of mag, but it did work! The Zofran helps a lot and I am feeling better. Still not myself and my stomach is absolutely insane! I have a loud stomach anyways, but now it’s just crazy loud!! I still am having some pains in my stomach, but I’m hoping they will slowly dissipate in the next few weeks as I near the 12 week mark and get out of the first trimester. I’m still kind of undecided about whether to tell the entire world about being preggo at week 12. It’s like on the one hand it gives me freedom to say what I want on my fb page, but then at the same time if I lose the baby it’s that many people I have to tell, then many sorry’s I have to face. My mom tried to make it positive and say it would be tremendous support and though it would be, I think it would also be very difficult. But then do I really wait until viability at 24 weeks to tell everyone? It feels kind of betraying in a way. I’m so excited and want to share my news with everyone, but it scares me. For now I’m just telling myself that there are 2 more sonograms until I decide what to do and hopefully it will show the clot absorbing. Our next sonogram is less than a week away and I just can’t wait. 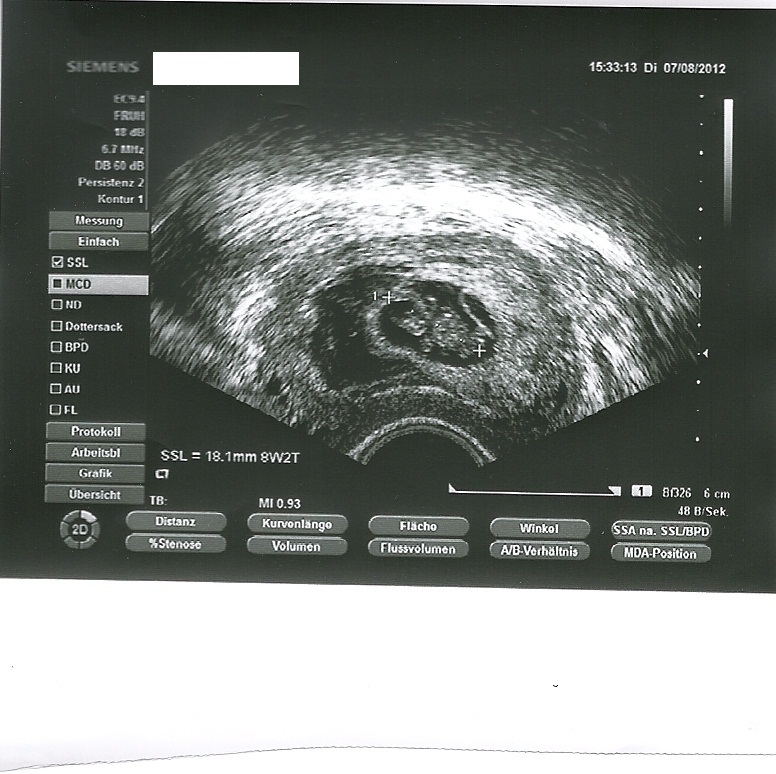 I thought about asking Dr. H if we can make a small video of the sonogram once we see everything is ok with baby. I’m just not sure if I want to, again the fears of what ifs. Maybe it would be something I would cherish if something does happen instead of a negative thing.